It is increasingly apparent that stressors associated with anthropocentric climate change are likely to have dramatic effects on future human settlement patterns. Although sea-level rise is one of the best understood implications of climate change, geographically precise estimation of potential population displacement due to tidewater inundation has proven remarkably problematic. At least within the USA, these problems partially stem from methodological limitations of population projection methodology at sub-county scales. 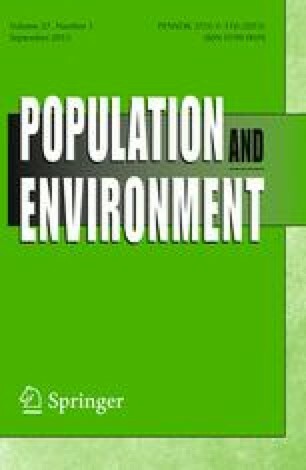 Using a case study of coastal Georgia, USA, this paper develops and demonstrates a new housing unit-based population projection method that is applied at the sub-county scale of Census Block Groups. These projections are then overlaid with spatiotemporally explicit assessments of future sea-level rise inundation provided through the Sea Level Affecting Marsh Model (SLAMM). We find that between 62,000 and 159,000 people are at risk of between 1 and 2 m of sea-level rise by 2100 in coastal Georgia. We would like to thank Georgia SeaGrant and the Georgia Coastal Management Program for providing funding for this project. We would also like to thank the nine reviewers for their plenitude of insightful and helpful comments. Clough, J., Park, R., & Fuller, R. (2010). SLAMM 6 beta Technical Documentation (Release 6.0.1 beta). Warren Pinnacle Consulting Inc. Retrieved from http://warrenpinnacle.com/prof/SLAMM/index.html. Cromley, R. G., Ebenstein, A. Y., & Hanink, D. M. (2009). Estimating components of population change from census data for incongruent spatial/temporal units and attributes. Journal of Spatial Science, 54(2), 89–99. doi: 10.1080/14498596.2009.9635180. Lam, N. S. N., Arenas, H., Li, Z., & Liu, K. B. (2009). An estimate of population impacted by climate change along the U.S. Coast. Journal of Coastal Research, 1522–1526. doi: 10.2307/25738044. Lutz, W., Sanderson, W. C., & Scherbov, S. (1998). Expert-based probabilistic population projections. Population and Development Review, 24, 139–155. doi: 10.2307/2808054. Parris, A. B., P., Burkett, V., Cayan, D., Culver, M., Hall, J., Horton, R., et al. (2012). Global sea level rise scenarios for the US National Climate Assessment: NOAA Tech Memo OAR CPO-1. http://cpo.noaa.gov/sites/cpo/Reports/2012/NOAA_SLR_r3.pdf. Shepard, C. C., Agostini, V. N., Gilmer, B., Allen, T., Stone, J., Brooks, W., et al. (2012). Assessing future risk: Quantifying the effects of sea level rise on storm surge risk for the southern shores of Long Island, New York. Natural Hazards, 60(2), 727–745. doi: 10.1007/s11069-011-0046-8. Swanson, D. A. (2010). The methods and materials used to generate two key elements of the housing unit method of population estimation: Vacancy rates and persons per household. In Paper presented at the 2010 PAA meeting, Dallas. http://paa2010.princeton.edu/papers/100049. http://paa2010.princeton.edu/papers/100049. Swanson, D. A., & Tayman, J. (2013). Measuring uncertainty in population forecasts: A new approach. Joint Eurostat/UNECE Work Session on Demographic Projections organised in cooperation with Istat in Rome, Italy. http://www.unece.org/fileadmin/DAM/stats/documents/ece/ces/ge.11/2013/WP_9.1_01.pdf. Tippett, R., Claibourn, M., & Cai, Q. (2013). Population projections by demographic details: A multi-layered approach. In Paper presented at the 2013 PAA meeting, New Orleans. http://paa2013.princeton.edu/papers/130735.